Workshops at The Tin Thimble in Loomis CA and questions answered about how to order your book! I am just about to update everyone on my workshops in California but before I do that let me give you a little info re ordering our book, Chrissie and I are getting a lot of questions about where and when it will be available to purchase. We are self publishing through Blurb, this means that the book will be available to buy online as soon as we have the final projects uploaded and edited!!! Because of the extremely tight time schedual I am under at the moment the book will be available to order sometime from the middle of next week but it may be that I have to do a little revision to text, images etc. from US if I discover any small errors when I get the hard copy. This means that if you are really keen to get your hands on nyour own buy it next week, if you want to wait another couple of weeks and get a revised edition (if it needs revision) please do so! I am going to be ordering my own first copies and having them sent directly to Loomis as there won’t be time to get them posted here before I leave on my travels, I can’t wait for both the book and the travels! If you live in US and are participating in any of the workshops and order a copy prior to my arrival ,of course I would be delighted to write a personal dedication in the book for you!!! I believe the books will take approx 7 to 10 days to arrive from the time of purchase, hope this answers all those questions. Now on to the CA workshop update …..
You may remember that I was to be joining other teachers for a wonderful Mother’s Day Fiber Retreat in Downieville but this has been changed to two workshops with me in house at The Tin Thimble in Loomis because finances were preventing people booking a longer extended stay with accomodation. Emma has posted all the details to their website but I have also cut and copied the main info from there and included it here at the end of this post. If you live anywhere within striking distance of Loomis do please come along, we are going to be having SUCH FUN!!! Last year was brilliant and I have to say that I am really looking forward to spending some extra time myself with Sharon. I have so many ideas in my head and Sharon (Emma’s mum) is the master of adding a few judicious stitches into almost finished felt, I am hoping she will help me translate some of my ideas into gorgeous, simple, wearable clothing! Anyway, enough writing for the moment, scroll down to read the info and if you would like to book your place please email Emma asap. 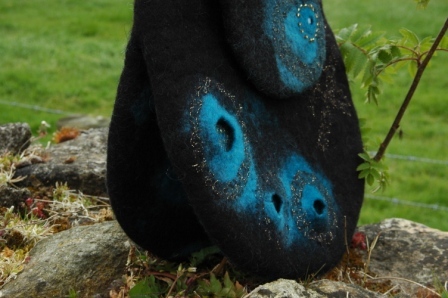 Fun and funky or subtle and sophisticated, let your imagination run wild when designing and creating gorgeous felted accessories to adorn the body! During this one day workshop participants will experiment incorporating glass nuggets, stones, fabric, leather, beads, buttons and found objects with wool creating unique wearable accessories. Each person will felt a collection of pieces which may include a combination of rings, bracelets, necklaces, brooches, scarbes, simple belts, small purses (or one large one), neckwraps, sleeveless mittens, flowers or whatever else takes their fancy. Nicola will bring a selection of unusual fabrics with her from Ireland including metallic meshes and sequin or glitter studded polyester in addition to some of the ‘mohair waste’ fiber which she is currently experimenting with in her work. Participants will be free to use these as accent materials but are also encouraged to bring alongany old bits and bobs they like from their stash, incorporating these into the felt lead to truly personal one off pieces of wearable art. A materials list will be available upon registration. Discover the possibilities of creating your own wonderful multi hued and textured fabric using the mosaic nuno technique. Working over two days participants will have the time and opportunity to plan, design and felt either a beautiful piece of wearable art or else a stunning decorative or functional textile for the home. Suggestions for wearable projects include a large ruffled wrap, mini skirt, folded oragami style top or complex panel perfect for inclusion in any one off piece of clothing, ideas for interior design include a beautiful wall hanging or an unusual and stylish table runner. A materials list will be available upon registration. 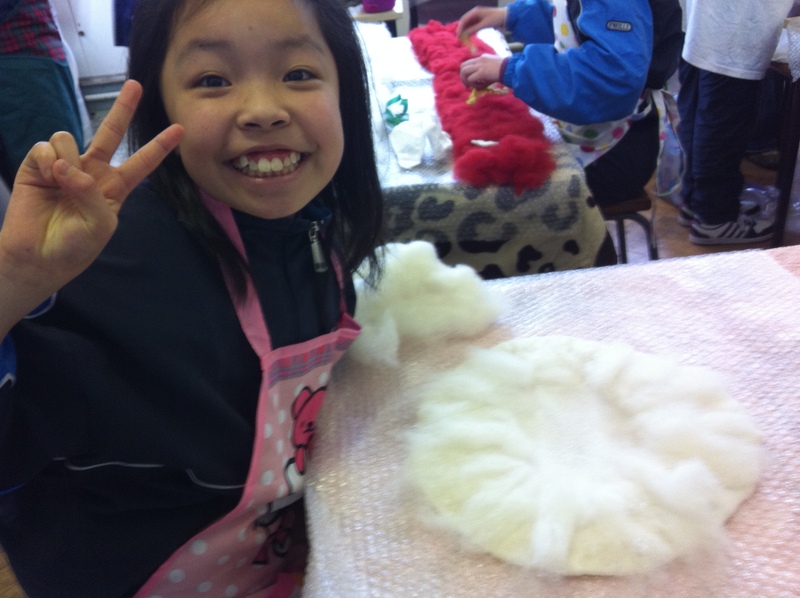 Felt and recycled material mobile for Earth Day and beautiful nuno mosaic! Happy Earth Day! Today is Earth Day and to celebrate I am throwing open my studio this afternoon and sharing a simple way of making a beautiful waste felt and recycled material mobile. This pledge ticks the ‘recycling and waste reduction’ box and is my way of joining others aiming to achieve ‘A billion acts of green’. In the evening I will be joining Cathy, Martin and other green friends for a walk to the summit of Mount Leinster followed by a party and some great music, Kiwi with an Irish twist!!! Check out this event here on Facebook and do come and join us if you are free. Places are limited to 6 for the mobile workshop but because I only made the pledge on Wednesday I am not actually sure if anyone will be joining me. If not never fear, I am going to make my own mobiles anyway and take some pictures of the finished pieces so you can all share the process online tomorrow! Due to circumstances beyond our control plans have changed for my workshops with Sharon and Emma of The Tin Thimble, Loomis, CA. Instead of us heading off for the fibre retreat as planned, we now have 3 days of workshops happening at the wonderful studio in Loomis instead, a special two day nuno mosaic workshop and a one day felted accessories workshop. Details of both workshops as well as a full materials list will be posted here and to The Tin Thimble’s website later today or early tomorrow but for now I am going to share two pictures of Sharon’s amazing nuno mosaic wrap from last year. 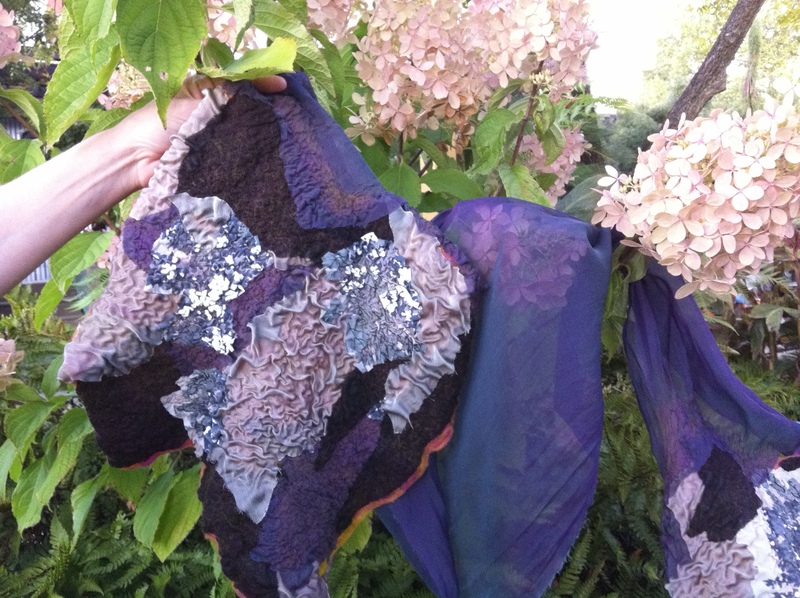 This stunning piece of wearable art was felted during one highly intense day, imagine the possibilities for a designing and creating a beautiful origami style jacket, wrap around skirt or large wall hanging when having the opportunity to play around with this technique over two days??? On the Friday participants in both MI and in KY have the option of taking a workshop titled ‘Simple vessels, purses and other three dimensional objects incorporating found objects’ and on the Saturday a workshop titled ‘Nuno mosaic and other interesting possibilities for wearable felt accessories’. Participants attending both workshops have the option of designing and felting larger and more complex vessels, bags, sculptural items, bigger nuno projects or indeed an art piece for the wall. As a result I have been toying with the correct materials list to publish for each workshop, eventually I have decided to provide a ‘minimum fabric and fibre requirement’ list for some of the projects participants may want to make and hopefully this will cover most potential eventualities! In this way each individual participant will decide for themselves what exactly they want to make and what materials then need to bring with them at a minimum,. I know from personal experience that I can never bring too much fibre and embellishment items with me when I attend any workshop so limiting myself can be a challenge, it may also bring unexpected rewards at times!!! Each participant will need to bring their usual felting equipment, bubble wrap, towels (please bring a few! ), hard olive oil/goats milk/glycerine soap, sprinkler, bamboo blind, pool noodle, net, whatever they like to work with themselves. Anyone felting a bag, vessel or any sort of three dimensional project will need some flexible plastic to use as a template/resist, I prefer laminate floor underlay but in an emergency we can use bubble wrap or whatever flexible plastic you have to hand. For participants felting nuno mosaic or large nuno wraps it is really best to have two long lengths of bubble wrap bigger than the starting size of the silk used, plastic trash can liners are OK too in an emergency so if you have a roll of them please just bring them along! NB I love working with batts but roving and tops are perfect too, bring whatever you have and like to work with yourself. 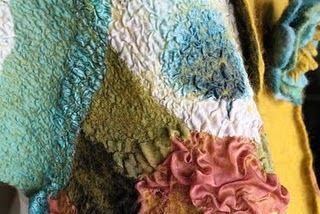 I will also be bringing loads of embellishments, inclusions, leather off cuts and artificial glittery fabrics with me for everyone to share as well as some of the mohair waste which I am currently experimenting with in some of my three dimensional work! Enough of the waffle, hopefully the following will be a guideline and I am always happy to answer any questions directly so please feel free to email me if you have a major concern ……. Friday’s CRAFTed session was chaotic but fun, all the girls are going to have beautiful items to take home with them as a reminder of this transitional year at the school. Working with 32 inexperienced felters is definitely a challange, I love the enthusiasm with which everyone is attacking their work, it does mean that Mairead (6th class teacher) and I are running all over the art room however during each session and I really hope that I am able to give each girl enough individual attention to ensure the process is an enjoyable one for everyone! These individual projects will be completed in our last session (they include bags, cell phone covers, vessels, flat felt with/without little pockets, two scarves and one beret!) where we will also work on our collaborative wall hanging, this will be hung in the school when the girls graduate later this summer. Because of the logistics when working with 32 beginners I am thinking that we will divide the class into three distinct groups next time, each group will rotate and have their turn to finish their individual project, create twisted yarn cords to add to their bags as well as select a square from the group piece which they will then embellish, add a pocket to or otherwise decorate with something of significance which they would like to leave behind as they leave for secondary school and move forward in life. Not sure if this will work but I am predicting it will be easier and more sensible than having everyone working on the same task at the same time, it will also avoid me running all around the art room all the time, more concentrated effort but less stressful I think for all envolved! MICHIGAN WORKSHOPS – I am delighted to say that our Michigan workshops on Friday 20th and Saturday 21st May are now open for booking! Please email the wonderful Dawn if you would like to reserve your place, I am just going to have another go uploading the full details and descriptions to the workshop page (having problems yet again today!) so in case of further technical issues the Friday workshop is titled ‘Simple vessels, purses and other three dimensional objects’ while Saturday will be dedicated to the fascinating art of ‘Nuno Mosaic’. One workshop will cost $140 or if both are taken the cost will be $130 per day, for more about what can be covered over two days check out the general workshop information further down this post. Wonderful vintage printed silk and chiffon create Marni's gorgeous textured nuno mosaic scarf! 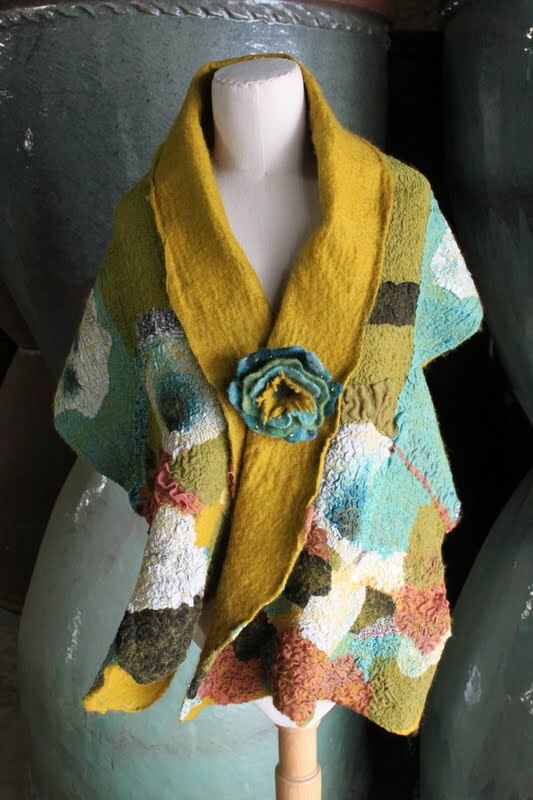 The nuno mosaic technique was taught to me by German felter Sigrid Bannier and is a wonderful way to create memorable wraps, scarves and yardage for incredible one off pieces of clothing. To refresh your memory (or if you are only visiting this blog for the first time!) here is an image of Marni’s amazing scarf incorporating vintage silk and chiffon from one of the Tin Thimble’s workshops last Fall, this was actually the first time ever that Marni had felted a nuno piece! If this has not whet your appetite enough there are some more nuno mosaic images from The Tin Thimble workshops here, some from the previous Fall at Urban Fauna Studio in San Fransisco here and a few of my own nuno mosaic skirt and matching wrap here. GENERAL WORKSHOP INFORMATION – I like to think of my workshops as a place where I share information and provide a recipe for felters to follow or adapt as they see fit! When I am teaching I always explain that there are many ways possible to reach a similar end result, I will be sharing the methods and tips which I find work best and usually guarantee me a successful outcome, it is up to each individual participant to determine whether they want to follow exactly or adapt the steps to suit themselves. Although each of my upcoming workshops has a title representing the main technique/techniques covered on that particular day, it will be possible for participants choosing to attend for both days to felt larger more complex projects that may not be specifically mentioned in the titles. An example would be someone who wanted to felt a complex felt sculpture or bag using several stitched resists, another would be a person wanting to create a reversible nuno felt shrug. If you have any queries in this respect please don’t hesitate to email me personally, I want to provide all the necessary information in order for people to make an educated descision. As previous experience has demonstrated most participants at my American workshops are regular felters, it should be noted that all the workshops are open to total beginners so please don’t feel you can’t attend if you are just starting out learning this fascinating craft, I would love to have you come along!!! Finally, at the risk of sounding pushy, the Kentucky workshops are now provisionally full for Saturday and only have 4 places left on Friday, if anyone is having a little think about things please don’t think for too long!!! Nuno mosaic workshop confirmed for San Fransisco! Thanks so much to fellow felter Nancy Schwab for helping me organise my first felting workshop in America. Nancy contacted Jamie from Urban Fauna Studio and hey presto, we are up and running with a nuno mosaic day on Thursday 1st October at her gorgeous studio and fiber boutique! I must say the images on Jamie’s website make me want to drool so I can only imagine what I will be like in reality when presented to all that gorgeous fiber and yarn. Isn’t it amazing the virtual connections that the internet enables and how wonderful it will be to actually meet some online friends in the flesh at last! Thanks also to Tobie, maybe we can get together anyway at Jamies and hopefully this will be my first felting experience of many in the States. If any of you are interested in securing a spot in what promises to be a fun day please just click here to go directly to the booking page!